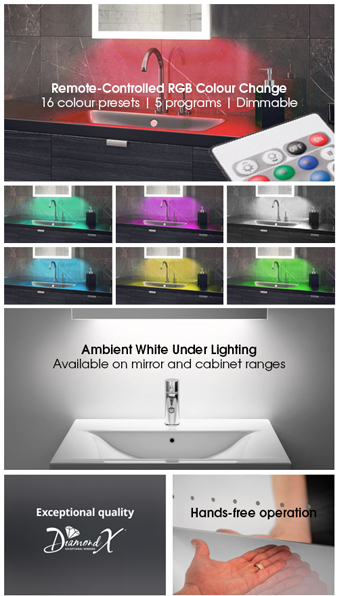 The eye-catching Audio Cube LED Light Bathroom Mirror brightens up any bathroom. The crystal clear heated demister mirror, kept fog-free by its built-in demister pad, is emblazoned with a beautiful arrangement of illumination, provided by highly energy efficient LEDs. Its sizing is perfect for smaller spaces, compromising neatly between height and width. 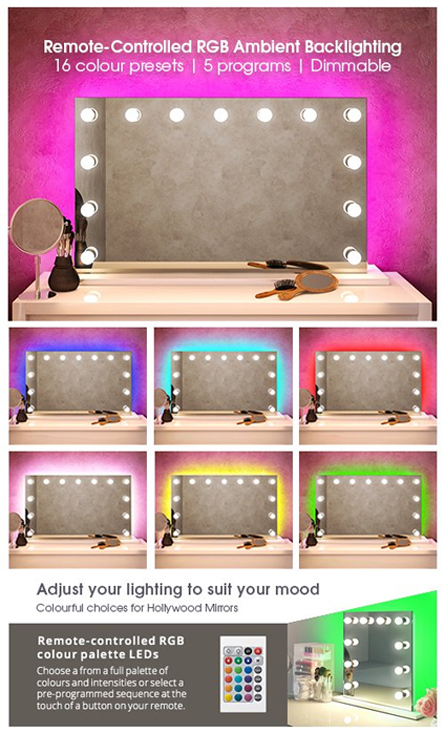 From behind the mirror, ambient lighting radiates onto the wall, adding a warmth and softness to the room. This lighting is controlled with a touch-free infrared switch located at the base. An independently operated 240v socket for electric shavers and toothbrushes, is also included and is located at the side of mirror. 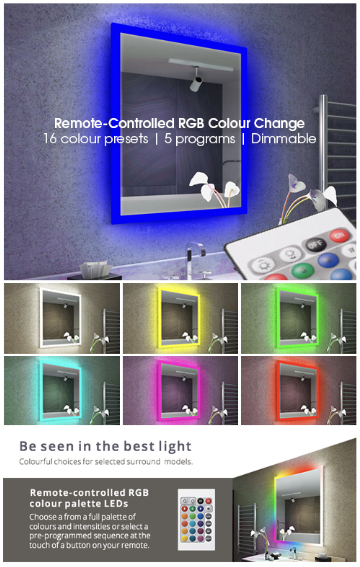 If you’re looking for an illuminated bathroom mirror with shaver socket, this model makes for a wise choice. Our Bluetooth Audio mirrors incorporate two high-quality 50w speakers, which can be used to play music from any device with Bluetooth connectivity. 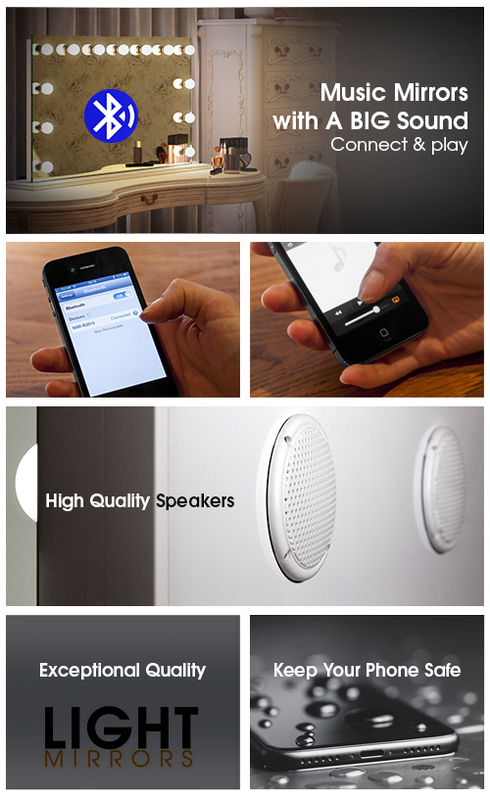 The wireless Bluetooth technology is easy to use, and compatible with many mobile devices. Play your favourite tunes straight from your phone! Very impressive and easy to use touchless Power On Infra-red sensor. Simply swipe your hand near the sensor to turn it on. It feels great to use and stops sticky finger marks ruining the look of your mirror. Are you fed-up of waiting for your bathroom mirror to demist after a bath or shower? - It's never a problem with this mirror! It includes heated anti-mist glass mirror technology that prevents steam build up. Leaving you with a completely clear reflection, no-matter how much steam is in the air. Cleverly hidden at the bottom of this mirror is a 240 volt shaver socket. Making it easy to power an electric shaver or toothbrush, right where you need it. Our Ambient back-lit wall wash mirrors transform any bathroom into an amazing visual environment. Our designers believe the bathroom mirror is one of the most important tools in great bathroom design. Only our mirrors feature amazing wall wash lighting that specifically enhances the viewing of colours and textures in the space around it. If you want to create that "Wow" factor in your bathroom, this mirror will make it happen. Please download the PDF for the Rear Fitting Diagram for this mirror.